Posted on July 26, 2018 at 5:29 pm. 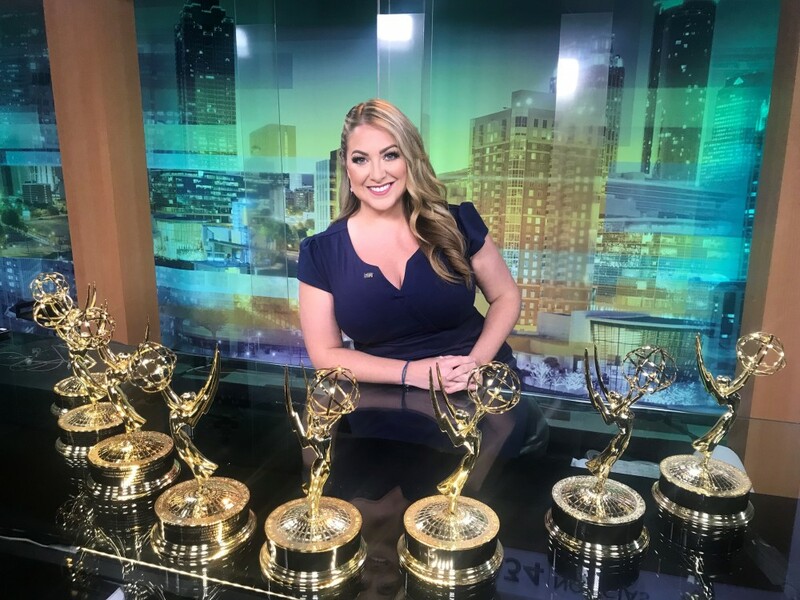 FIU journalism alumna Amanda Ramirez ’05, MBA ’10, WUVG 34 Univision Atlanta Executive Producer/News Anchor, recently took home 8 Emmys® in several categories, including General Assignment Report – No Time Limit; Weather – Feature, Segment, Program or Special; and Continuing Coverage for the station’s outstanding coverage of Hurricane María, throughout the storm’s passage across Puerto Rico and the Caribbean. We spoke to Ramirez about her career and experiences FIU, and she offered detailed insight as to how to navigate the world of broadcast journalism. I learned so much at FIU! I didn’t just obtain the knowledge I needed to begin my career in journalism, I also learned how hard I would need to work to reach my goals in the field, I got my first shot at print journalism at The Beacon, and I met my mentors and people who have become dear friends and colleagues and with whom I still maintain relationships to this day. My professors at FIU provided great support to help me achieve my goals. I have great memories of Prof. Teresa Ponte. Her classes were among the toughest I had at FIU and she always pushed her students to give 110%. I loved that then, and now I can see how this prepared me for the reality of an industry that has been in constant transformation since I was at FIU and that each day demands more of reporters, anchors, producers and everyone in the field. What path did you take to attain your current career? I first started writing at FIU’s student newspaper, The Beacon. After gaining some experience, I was chosen for a program that FIU established with The Miami Herald and in which several students, including me, worked as reporters for the Neighbors section of the paper. It was a great experience! I wrote an article per week, received a stipend to pay for part of my out-of-state tuition and gained valuable experience. After several months, I applied for a NATAS scholarship that a professor at FIU had suggested I apply for. I interviewed with the judges without knowing that this would open the door to my future in broadcast journalism. The interview took place at Univision Miami and at the meeting, I met my future supervisor, Angela Ramos. She was part of the judging panel and when she saw my portfolio with the articles I had written for the Kendall Neighbors section, she said, “I’ve read these! Great work”. I got a call back from her a few weeks later letting me know that I had been selected as a recipient for the NATAS scholarship and that she also wanted to offer me an internship in her department at Univision Miami – and the rest is history. I’ve been with Univision ever since then… 13 years. I absolutely LOVE my job! I think that being part of a small, driven, hardworking team is what I love most because we get to (and must) do it all. Each one of the less than 10 people in the newsroom learns and takes part in every step of the production of our newscasts. Personally, I research, anchor and produce every day; but I often get to go out and produce my own stories, record B-roll, conduct interviews, do standups, edit my own packages, and/or investigate. I am passionate about ALL of it and am very blessed to be able to work in a newsroom that allows me (and everyone else on the team) to do it all. Also, one of the most fulfilling parts of my job is to be able to guide younger journalists. It fills me with great joy to see how they love to learn and listen to tips. I can see how they apply the advice they receive, produce great work and grow as professionals. When they are recognized for the wonderful work they do (like when they get Emmys) I feel so proud of them! It really fills my heart with a joy I can’t describe. 9-11am: I work out. This is my me time, which is so important when you work in a field as demanding and time-consuming as journalism. I would recommend that any aspiring journalists set up a daily time slot to take care of themselves. It doesn’t have to be for working out but everyone needs their ‘me time’. 11am: I have an editorial meeting over the phone with our Univision Atlanta News Director, reporters, and production assistant. We decide what stories each person will cover. 12 noon: I assign stories to our cameraman. 1pm: I arrive at the office, set up the rundown for the day, assign more stories, make calls to sources or to corroborate information, respond to emails, and begin writing. On some days I also conduct interviews that have been coordinated in the studio, help reporters by reviewing their scripts or any other help they may need for their stories, and work on writing and/or editing any packages I am producing. 4:15pm: By this time, the 6pm newscast script is almost finished (although there is always breaking news that we continue to monitor). I’m able to sit with our makeup artist and take a mental break for a bit while she works her magic and gets me camera-ready. 5:00pm: Makeup is finished. I make sure the reporters and cameraman haven’t had any issues with their stories and that everyone’s work is progressing as needed. Then, I sit and review the rundown, make any necessary changes to stories that are still developing and print the script. 5:45pm: By this time, I’m sitting at the set, our TD is setting up cameras and I am organizing the printed script and making final changes. 5:58pm: Our live 6pm newscast begins. This is when I am most relaxed. I love the adrenaline of being on air and it just feels natural. Plus, all the hard work is basically finished by the time I hear “cue Amanda”. During commercial breaks I update stories, work with the crew in the control room to make last minute decisions regarding the show and check in with our Facebook followers. 6:30pm: 6pm show is over. We record news briefs. Then we begin preparing the 11pm newscast and do all this all over again until the 11pm show if finished and our workday has ended. I went to college at a time when the journalism industry was just beginning to change into what it is today; but back then, our professors already knew that a lot would be required of journalists once everything transitioned into the digital world. It was at FIU that I learned the importance of being able to do it all. I was taught to write my own scripts, shoot my own B-roll and interviews, edit my own packages, and all on tight deadlines. I became a video journalist in and around FIU’s Biscayne Bay Campus. Now, I am still a video journalist when I need to be (like when Hurricane Maria hit Puerto Rico and all I had as instruments for preparing stories for our Univision affiliates was my cellphone, a selfie stick and a laptop); but I am also able to juggle multiple roles in my day-to-day work as Executive Producer, Anchor, and Writer at Univision Atlanta. All the classes and professors had an impact on me. I was very focused on learning as much as I could so that I could be as prepared as possible by the time I was ready to enter the field. As I mentioned previously, Professor Ponte’s classes were especially important because she taught most of the broadcast journalism courses when I was at FIU and she taught us a lot of very valuable techniques. She was also very focused on motivating students that worked hard. She was constantly suggesting we apply for scholarships, conferences, trainings, etc. I remember that it was thanks to her suggestion that I received a grant to attend my first NAHJ conference, which was also a very valuable experience. Be ready to work hard! This is such a rewarding field, but it takes hard work, dedication, true passion, and a genuine interest in being the voice of people who are unable or fearful of using their own voice. Don’t be a diva. People sometimes think that being a TV news anchor or reporter is a glamorous job. Maybe it is eventually for some people, but I don’t know any anchors or reporters (not even the most glamorous ones) that didn’t have to carry their own equipment at some point, cover stories under the rain or face other very un-glamorous situations for the sake of informing viewers. It’s part of the job. In my opinion it’s the best part of the job, because when you are treading under rain or snow, or in battling against high winds or extreme heat, usually you are covering a situation that is dangerous to your viewers and it is when they need you most. First, in smaller markets, your viewers tend to depend on you a lot. Bigger cities have lots of options when it comes to news but, smaller towns do not. For example, I was transferred to Atlanta to inaugurate Univision’s first newscast in the state of Georgia. We were the first Spanish-language newscast in the state! This was only 7 years ago. The Latino community was so appreciative and they truly began to depend on us for their information. It’s a great responsibility but also such an honor. I started my career in a big market (Miami) and, although I learned a lot from my colleagues, I realized that for me to reach my full potential, I needed to go someplace where I could put all my talents to the test. In big markets, the teams are usually large. Plenty of people work there and you are basically confined to one role, either a reporter, a producer, or an anchor; but you are rarely ever given the chance to try it all. You will get that chance at a smaller market and it’ll allow you to realize what you truly love to do and focus on that or, the way I prefer it, to not have to choose between roles. I love to produce, anchor, write, investigate and work as a VJ when necessary. I wouldn’t want to have to choose between those roles or sacrifice any of those passions. Also, when you work with a small team, you can learn from everyone and that team becomes your work family. It really is a wonderful experience and a blessing in a challenging field. This story was originally published on CARTA News.